Choosing the right kind of fishing rod can make a world of difference between a successful day on the water or going home empty handed. If you want to have a successful and an enjoyable day on the water, you need to choose the perfect rod. Choosing the perfect fishing rod depends on what kind of fishing you are going to be doing, what type of rods you will need and most important of them all… where you will be fishing. In this article, you’ll find everything you need to know about different types of fishing rods. There are different types of fishing rods, depending on what type of species you are going after, what type of techniques are you going to use and what cover do these fish have. Having a proper idea of different types of fishing rods can help you get the job done the most effective way possible. We already covered “How To Choose The Right Fishing Reel”, check that out if you are going to be fishing for the first time. If not, continue reading. Think of fishing rod as the most vital tool in your toolbox. Let’s face it, it’s hard to go fishing if you don’t have a fishing rod. Based on your preference, you can pick either Spincast rod or a Baitcaster rod. Note that these types of rods are great for a beginner. There are also other types of rods, below we are going to cover some of the most popular fishing rod types. If you are one those people that are still learning “How To Cast A Fishing Reel”, then go for this one. Spincast rods are the very basic type of rods and really good for beginners. These are also known as closed faced reels. Why closed faced? Because you can’t see your fishing line spool underneath the cover of your reel. So, how do you cast a spincast rod and reel? You just push the button on the reel and cast out the line. The next popular type of rod and reel are the Spinning rod & reel. The difference between a spincast rod and a spinning rod is that you have your reel on the lower side of the rod. There is also a bail on the reel that you can flip in order to let out the line. To bring the line in, you simply just close the bail. In our personal opinion, these type of rods and reels are very universal. You can use them in all different types of situation. They also come in various sizes. Because they can be used almost everywhere, they are one of the most popular reels and rods combos out there. The baitcaster has the reel on top of the rod. It has an open face look, but the cool feature of this reel is that the mechanism allows you to spool the line evenly back on to the reel. 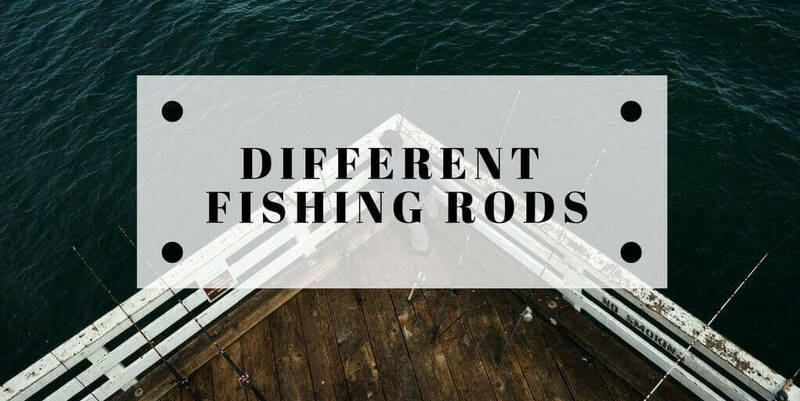 Just like the spinning rod, these rods also come in all different sizes. You can also use them almost anywhere. It’s kind of a heavyweight type rod. Not for your usual fishing. This type of rod is typically used in trolling or while bottom fishing. If you are just going to drop your bait down to the bottom of the water, then this is the type of rod to go for. Unlike most other reel and rod combos, this one is specialized with a heavier line. It takes the very light fly all the way out to the water. The heavy line is attached to the monofilament of the rod. At the end of the monofilament is the light fly. They also come in a wide range of shapes and sizes. Area of usage? Fly fishing! Pretty obvious. These rods are specifically made for fly fishing. Just like the spinning rods, these ice fishing rods come with the same type of feature you would expect in a spinning rod but much shorter in length. The length usually ranges for 24”-36”. Some of them doesn’t even come with a reel. These classics are still being used for ice fishing. These are some heavy-duty rods. They have heavy tips and large eyes and designed for fishing in the ocean. They also come in all different sizes. They also have a long rear end to help you fight large fish. Consider using a saltwater spinning reel. Never use a freshwater spinning reel on them. Fishing while surfing? Nah! These types of rods are almost like sea rods. These are so popular that they had to warrant their own category. These are extremely long rods. You can use a heavy sinker with them. Casting these rods require a two-handed casting technique because the rear end is long, and the bait needs to be cast a long way. Looking for the ultimate compact rods beside pen fishing rods? These telescopic rods are the most compact rod you can find. These are extendable rods. While closed the length is around one to two feet and you can extend them up to 20 feet long. When extended, these rod looks like your ordinary spinning rods. The flexible tip makes casting easy. The smaller version of telescoping fishing rods. These are even more compact. These are mainly designed to fit in a case that looks like a large pen. Not very durable if you want to fight a medium to large fish with these rods. These are very light rods, and if you want to get most out of these rods, you need have some good quality reels and fishing lines. So, in the end, choosing a fishing rod comes down to your own preferences. We tried our best to keep this guide as short as possible. Let us know what you think about this Different Types Of Fishing Rods & Reels Explained article in the comments below. If you liked it, feel free to share.